This is my second special on a record label that wasn't a record company, but a store brand - of Sears, Roebuck & Co. , the store chain that is still around as Sears. Today some releases from 1938 and in these days their mail order catalogs were immensely popular in rural areas, being the only shopping opportunity next to the general store in a nearby town. In a place where nothing happened, it was a wonderful dreambook for children and a great source of entertainment for their parents. 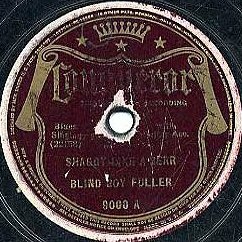 The Conqueror label brought the popular tunes of the day, but also some great blues and jazz, re-issued from the Vocalion label. And I wonder, as the catalog listed every item that could be ordered at Sears Roebuck, if a farmer somewhere deep down in Ohio, Kentucky or Wyoming, may ever have ordered a record of an unknown musician whose name tickled curiosity - such as Peetie Wheatstraw.